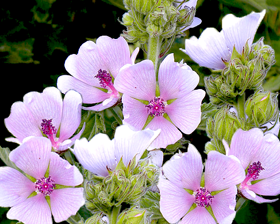 Marshmallow (Althaea officials) an elegant looking plant with velvety, soft leaves and pale pink flowers that stay on all year round, which makes marshmallow an ideal decorative plant. Marshmallow plants are also fairly hardy and well used to wet and cold weather, which makes them easy to maintain and look after. The seeds from the marshmallow plant are also great ingredients for cooking, helping to add distinctive flavors to all sorts of dishes, both savory and sweet. Stratification of seeds (a period of cold) in 6 weeks can improve germination rates and times. Sow seeds 10-12 weeks before the last frost date. Transplant out to moist, sunny location when seedlings reach 5 cm.